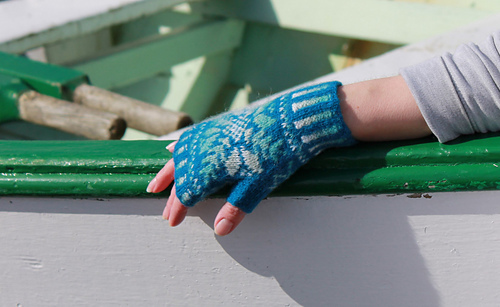 Snowflakes for Adrienne Mitts were originally designed as a gift for a friend, who wanted something blue. 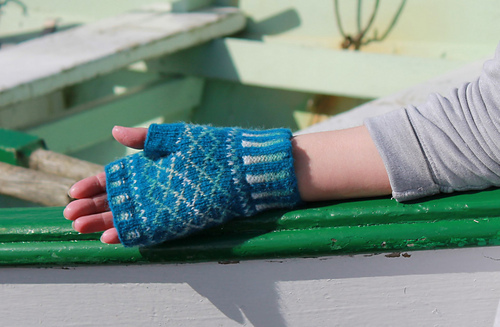 The motifs are based on traditional Fair isle patterns and the ribbing is traditional corrugated ribbing. The mitts are worked in the round, with the thumb worked using the waste yarn method (for which links to suggested online tutorials are suggested). 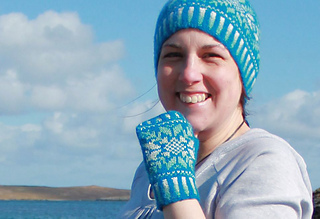 A pattern for a matching hat is available - both patterns are available together as an ebook for a discounted price. S (M, L) to fit hand circumference 18 (19.5, 20.5 ) cm/7.25 (7.75, 8.25) inches, designed to be worn with no ease for a snug but not constricting fit. Shown in size S.
Circumference 18 (19.5, 20.5 ) cm/7.25 (7.75, 8.25) inches, length 15.5 (16, 16) cm/6.25 (6.5, 6.5) inches. 1 ball each in Petrol 750 (MC), Aqua 929 (CC1), Surf 135 (CC2), Eggshell 768 (CC3), White 304 (CC4). If you wish to knit the matching Snowflakes for Adrienne Hat you will require 1 extra ball of the MC (Petrol). However knitting the large hat and the medium or large mitts will use up almost 50g of the MC, so depending on knitting style it is possible you may require a third ball. 3.0mm double pointed needles, or size required to match tension. 2.75mm double pointed needles, or one size smaller than needle required to match tension. 30 sts and 36 rows to 10cm/4 inches using larger needles, measured over Fair Isle pattern after blocking.